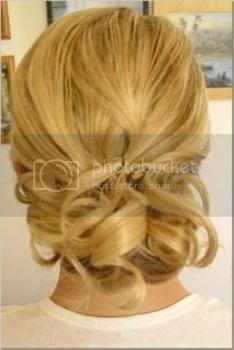 LongLocks Salon › Hairstyles and Styling › Wedding Hair Styles › can anyone tell me how to do this style? can anyone tell me how to do this style? Re: can anyone tell me how to do this style? It is difficult to tell exactly how this style is done, but from my best guess, the hair is about shoulder length. Start with hair that is already curled. Pull the hair back like it will be put into a ponytail, but instead use bobby pins to pin small sections back in a "messy" style making sure to criss-cross the sections. It's possible that the person modeling the hairstyle has longer, maybe BSL length hair with layers that start at shoulder length. The underlayer of hair (the longest part) is pulled into a soft bun at the nape of the neck while the shoulder length layered hair was left free. Then the ends of the layers were curled and pinned back into place, artfully arranged around the bun. It could be too that the under layer of hair that was bunned was only partially done, with the ends sticking out and then curled and pinned to add some oompf to the overall style. it appears to be short hair pinned back how bikerbraid described, although if I were to attempt a similar style, being that I have long hair, i would make a tight, neat bun at the nape of my neck but instead of tucking the ends I would leave a few inches sticking straight up, pin my hair and bun in place, and then curl the ends sticking out and drape them around my bun. I actually wear my buns like that now, only higher on my head, and I dont curl my ends hehe.